KCCA FC will enter Tuesday’s league encounter at home to URA with second spot top priority on their agenda. The Kasasiro Boys are currently third on the table with 45 points from 23 games and seat four(points) behind leaders SC Villa who have played one more game than KCCA. They are expected to be without the injured trio of Muzamir Mutyaba, Derrick Nsibambi and Ibrahim Saddam Juma. However, they will be welcoming back U20 stars, Julius Poloto and Allan Okello who were away with the Hippos and did not take part in the 1-0 win over Kitara in the Uganda Cup over the weekend. 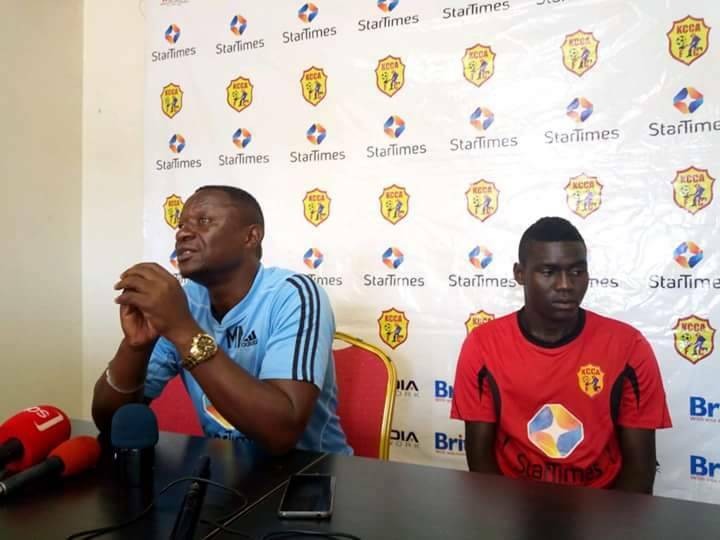 “We are going to approach the game the same way we have been approaching other league games,” said Mike Mutebi in the post match press conference at the StarTimes stadium Lugogo on Tuesday. “We know it is not going to be easy as they(URA) are a very good footballing side that loves to play and the fact that we have a good pitch, it will entice them to try and impose their style on us. “They also have a well educated manager in Nkata(Paul) who will surely know his way around us which makes it a whole lot harder. Asked about the goal scoring issues that seem to be persistently affecting URA, Mutebi had this to say. “Yes we are not scoring as much as we should which is so worrying. “When you look at how the season is unfolding, there is a very big chance that it may go down to the wire and may be decided on goals. “The good thing is that we are currently the league top scorers but we need more goals and luckily for us, we have started scoring again. For URA, they have had a disappointing season as far, knocked out of the Uganda cup in the round of 64 by fourth division side KJT and seat only six points away from relegation. With only five games left to play in the season, they will know that it is still possible to be relegated as the teams below them have started picking up wins and will go into Tuesday’s game on the hunt for maximum points. This fixture has not witnessed an away win since November 2013 when KCCA defeated URA 3-2 at the Mehtah Stadium in Lugazi. In that period, there has been five home victories and three draws, including the last two games. The reverse fixture last season ended 2-2 with also the first meeting this campaign ending 0-0 at Namboole. URA has not won away to KCCA since May 2011. The Tax Collectors have lost three and drawn as many of their last six visits to the two time league defending champions. KCCA go into the fixture having scored in each of their last 11 league games at home to URA, managing 16 goals in the process whilst conceding nine. The Kasasiro Boys are undefeated in any of their last 14 games in all competitions(W9 D5). The last time KCCA lost a game was in the CAF Champions League when Madagascan side CNaPS Sport defeated them 2-1 in Antananarivo. In the league, the Kasasiro Boys have gone 11 games without succumbing to a loss(W6 D5). Their last defeat came at the hands of Proline on 24-Nov-2017. In the recent past, Mike Mutebi’s charges have been impeccable at home, losing only one of their last 29 league games(W22 D6). For URA, they have won only one of their last six games in the league(D2 L3). The victory came at home to Kirinya JSS at the start of the month. Away from home, Paul Nkata’s men have won only two of their 12 fixtures all season(D2 L8).